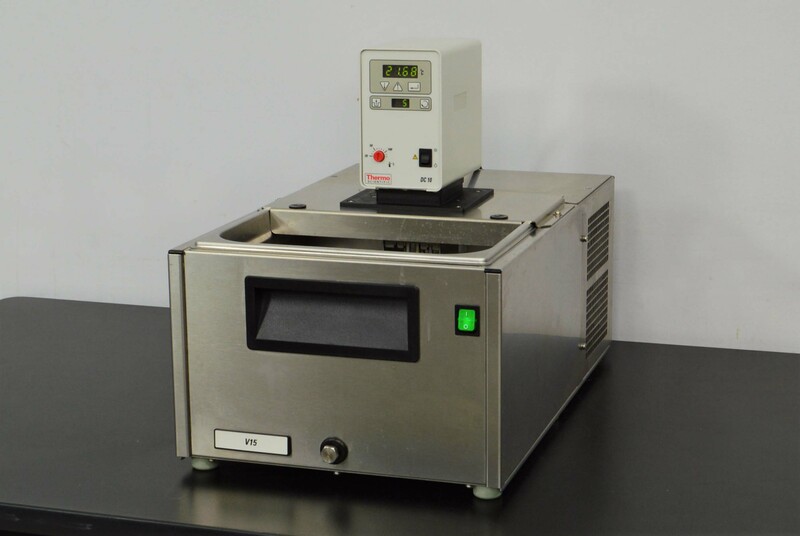 Thermo Electron DC10 Temperature Controller with V15 Chilled Water Bath . New Life Scientific, Inc. This DC10 temperature control module and V15 water bath are both in good working and cosmetic condition with minor wear and age. The V15 is constructed of stainless steel and has a depth of 200mm to accommodate both large and long objects. The DC10 can be used with water or a mixture of water and antifreeze. A large range of accessories such as an immersion cooler, a set for external circulation, test tube racks or lift plates can be used to quickly adapt the module for different applications. This DC10 and V15 would be an excellent choice for anyone looking for a functional, well-maintained chilled water bath at a fair price. Our in-house technician inspected and tested this DC10 temperature control module and V15 water bath, confirming it to be in good working condition but not reaching manufacturer specifications of -20°C but chilling to -7.7°C. This water bath is not equipped with a circulating pump and should not be considered a circulating bath.